KawaiiPunk - Kawaii Mascot Blog: Shiro the Hero! See? I told you Shiro had cute creatures! And what a variety too! 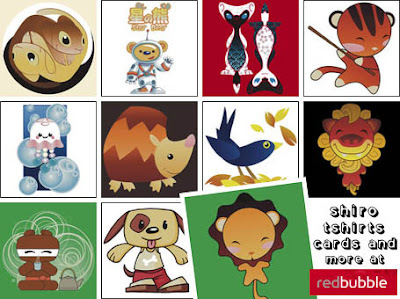 Dogs, cats, bunnies, birdies, mice, jellyfish, bears, tigers, lions, elephants, monkeys, even hedgehogs! It’s like taking a trip to the cutest zoo ever! And the best part is… by picking up a t-shirt, card, or print, you get to take your very own cute creature home with you! Have fun!